The UB Genomics and Bioinformatics Core is located on the Buffalo Niagara Medical Campus at the New York State Center of Excellence in Bioinformatics and Life Sciences. 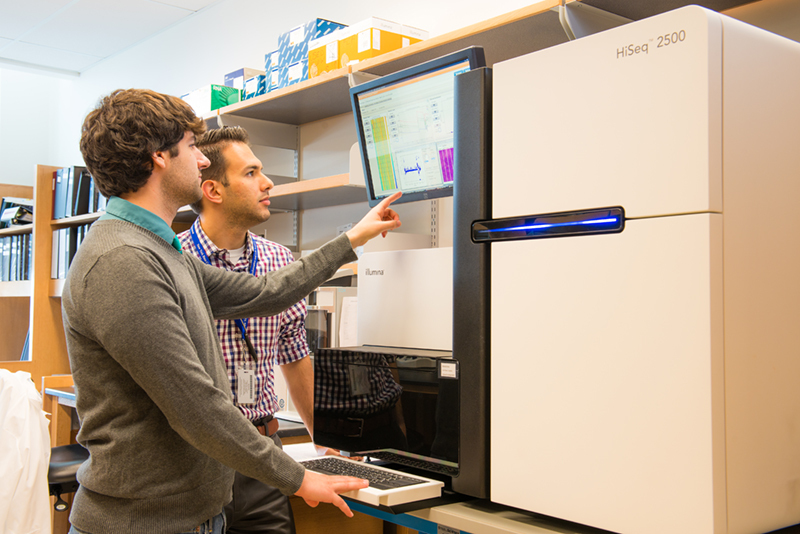 We are proud to be the first next-generation sequencing service provider in Western New York. Upgrading to the illumina NovaSeq! Our sequencing capacity has greatly increased with the addition of the illumina NovaSeq system. The NovaSeq has four available flowcell options, capable of producing between 600 million and 10 billion reads per run. In addition to increased output, the NovaSeq features a maximum 48 hour runtime, allowing for rapid processing of biological samples to bioinformatic results. Single-cell 10X Genomics Chromium Is Here! We are excited to announce that we now offer the 10x Genomics Chromium platform. This platform specializes in single-cell RNA-Seq, single-cell V(D)J, and whole genome linked read libraries that are compatible with our illumina sequencers. Please contact us for more details on how to best leverage this new technology, and for pricing information. Read more about our 10x offerings , or about the 10x bioinformatics pipelines in place to handle these datasets. illumina NovaSeq – The addition of the illumina NovaSeq allows our core facility to take on projects of any size, from large-scale single-sell sequencing efforts, to whole genome and denovo assembly projects. Enabled by our direct connection to UB’s Center for Computational Research, a high performance computing cluster, we are able to process samples rapidly and provide timely results to researchers. illumina NextSeq – This new addition to our offerings allows us to rapidly process RNA-Seq, ChIP-Seq and other similar experiments that require less output than a NovaSeq, but more than a MiSeq. Contact us for details! illumina MiSeq – This platform specializes in more targeted sequencing geared toward smaller genomes and smaller search space investigation. This includes Amplicon, Exome and Bacterial 16S sequencing. On staff are four dedicated Bioinformaticians to help facilitate research projects that are sequenced at our facility. Standard analysis of sequencing data includes FastQC quality reports, FastQ screening for common contaminants, and assay specific genomic alignments. Single-Cell RNA-Seq – 10X Genomic oriented single-cell analysis. Linked-Read – Genome, Exome and denovo assembly projects powered by 10X linked-read. Whole-Genome/Exome – Standard (non-linked read) genomic alignment, GATK best practices variant calling, and variant annotations. ChIP-Seq – Genomic alignment, quality assessment using ENCODE standards, peak calling and visualization are offered as standard analysis for projects sequenced at our facility. RNA-Seq – Genomic alignment, and quantification of Gene and isoform level expression can be preformed via the HTSeq or Cufflinks algorithms and data visualization is optional via DESeq2 or CummeRBund. miRNA-Seq – miRNA quantifications against the most up-to-date miRBASE is available through our commercial license of the CLC Genomics Workbench product. Custom Consultations – We welcome collaborations on both research projects and commercial endeavors. Please contact us for more details. A La Carte – An assortment of offerings, including standard genomic alignments, adapter trimming, SNP calling etc. are also available upon request.